In a previous blog I had promised to share my NEW favorite recipes with you, as I discover and taste-test them. Once you try it out for yourself, I'm sure you'll agree that "it's a keeper". I mean, what's not to like about this salad? It's fast and easy to prepare. It's chock-full of nourishing ingredients. It's a complete protein and a meal-in-one. Its contrasting textures make it fun to eat. In saucepan, bring water to a boil. Add salt and quinoa. Cover, turn heat to low, and simmer for about 15 minutes, or until water is absorbed and quinoa is cooked. Remove from heat. Fluff with fork. Set aside to cool to room temperature. 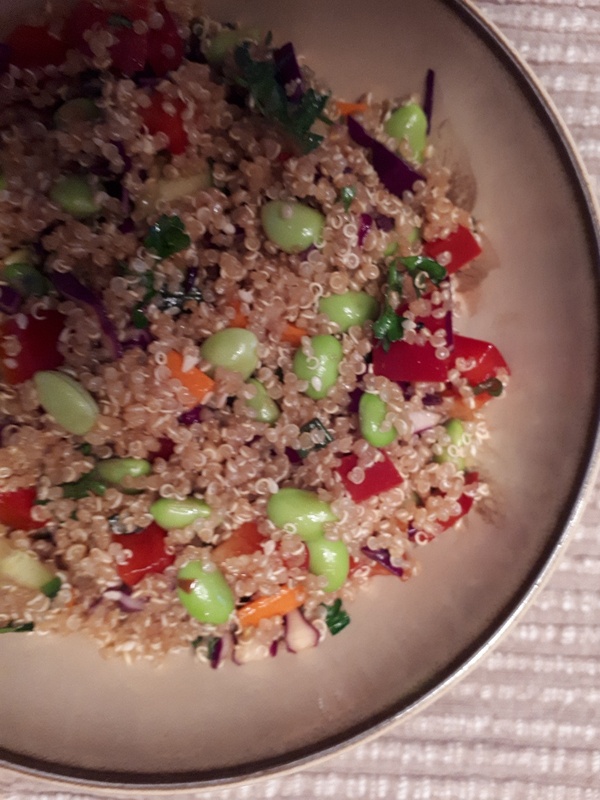 In a large bowl, combine quinoa, edamame, cabbage, red pepper, carrots, and cucumber. In a small bowl or measuring cup, whisk together all the dressing ingredients. Drizzle dressing over salad when you're ready to serve. Stir gently until thoroughly combined. Enjoy! This salad is delicious served at room temperature or chilled.